Check back here to view the seasonal specials and travel packages we offer. When you reserve a weekend getaway or extended vacation at Hawthorn B&B, you can rest assured that you will enjoy wonderful accommodations and a delicious, home-cooked breakfast for a great price. 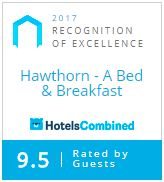 Hawthorn B&B’s pricing remains the same year round and does not inflate for high volume, seasonal or holiday periods. Guests can reserve a guestroom year-round without having to worry about price fluctuations. We believe in offering the same quality and hospitality regardless of the time of year or special event. Guests can request to have friends or family join them for breakfast, for an additional fee and advance reservation. Likewise, we are happy to provide dinner for guests, based upon availability and by advance reservation of at least one week. Whether you are planning a romantic Missouri getaway or you are visiting the Independence area for the first time, our vacation packages will help make your stay at Hawthorn B&B even more memorable. Select any of the following offerings at the time of reservation. Fresh cut flowers (assortment)….$45.00—for special requests please contact the innkeeper for pricing. Stay tuned for additional information about day trips. Enter your E-Mail address below to sign up for our Newsletters!